Don’t Close Your Eyes is now in paperback! …So the day is finally here. 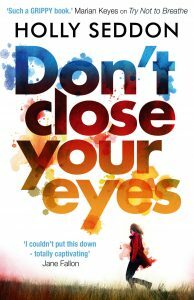 My second novel, Don’t Close Your Eyes, is published in paperback in the UK and Ireland! I’m still in The Netherlands for the moment, glamorously dealing with my son’s chicken pox and using my literary skills to do loads of laundry as we’ve still not caught up after Christmas’s Norovirus outbreak. But I’m vicariously living through friends and readers who are kindly sharing pictures of tube and rail posters like this one from my schoolfriend Charlotte. Isn’t it beautiful? I’m so grateful to my publisher, Corvus Books. 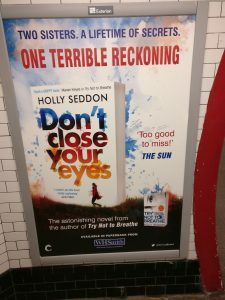 Don’t Close Your Eyes poster, Charing Cross Underground Station. It’s an absolute privilege to publish a second book, and I really hope you enjoy it.